Six new volunteers joined us on board Silurian in Ullapool on 6th October for the start of our latest research survey. Although greeted by some slightly wild weather conditions, spirits were high as everyone excitedly discussed the week ahead. Unfortunately, the unsettled weather remained for the following day and we resided to the fact that we would be remaining in Ullapool for one more night. The day was in no way wasted though, as training commenced! We spent the day learning all about the cetaceans that can be found in Hebridean waters and how best to spot and record them. We even managed some time for a few games of bananagrams, as well as an evening trip to the pub! Spotting cetaceans from the bow of Silurian. Despite the first storm bound day, we managed to cover an impressive 159.3 nautical miles, with the newly trained citizen scientists spending over 26 hours on effort collecting visual and acoustic data, recording over 25 hours of acoustic recordings. On the first day of surveying we covered 47.2 nautical miles crossing the waters known as the Minch, spending the night in Stornoway, before heading back across this time further north. Due to some stronger winds towards the end of the week, the last few days were spent surveying waters along the coast of the main land. Along this coastline we anchored in some spectacular spots! Loch Nedd was particularly stunning, with the trees surrounding the lochs radiant in their autumnal colours. We were even greeted by some friendly seals and an otter was spotted on the shores playing in one of the waterfalls. Another fabulous spot was Loch Badnaban, which is where we spent the penultimate night of the survey. With clear skies, which had accompanied us all afternoon, we gathered on deck to enjoy the amazing array of stars, with the milky way out in force! However, the best was yet to come. As the sky darkened further strands of lights started to dance across the sky and we soon realised we were starting to see the aurora borealis! For many of us on board it was our first taste of the northern lights. It was a fantastic display, varying in shape, colour and hue continuing for almost an hour. Accompanying the Northern lights was an array of shooting stars above and sparkling bioluminescence below. It truly was a magical evening! We had some amazing sightings of several species of cetacean, encountering white-beaked dolphins, common dolphins, minke whales and harbour porpoise. The morning of the second day was particularly cetacean-filled. We encountered a pod of common dolphins an hour into surveying, who spent almost half an hour swimming around the boat, coming into bow ride and leaping enthusiastically. The sightings continued, and we encountered another pod of dolphins as well as a total of four minke whales. One of the whales surfaces not far from the boat before heading in the direction of some diving gannets. There must have been food in the area because not long after the whale lunged out of the water, engulfing a mouthful of fish. 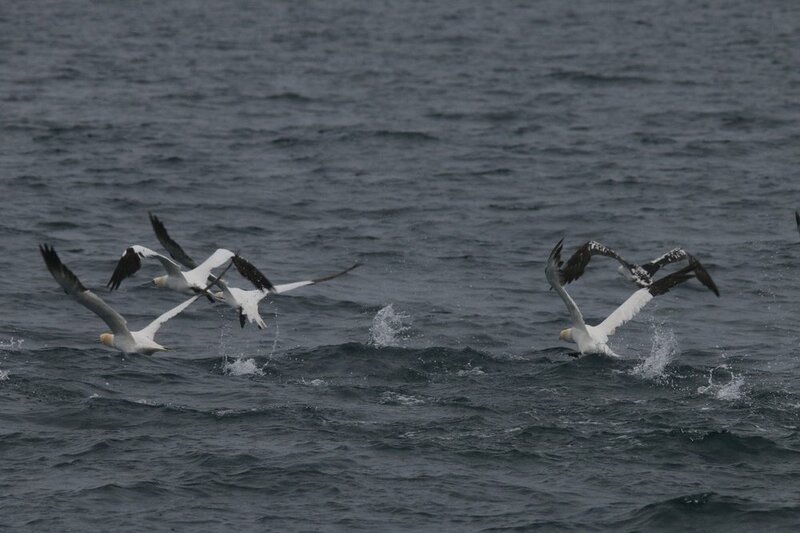 The diving gannets that we saw were amongst the 1052 birds that we recorded, which included common guillemots, kittiwakes and shags. Massive thanks to all of the citizen scientists that joined us on board: Bruce, Chris, Liz, Nuno, Sarah and Rachel – we could not collect our vital data without you, and it was such a pleasure having you on board!